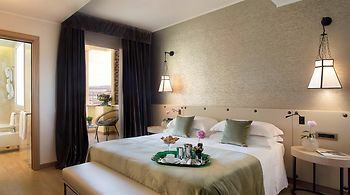 Starhotels Metropole, Rome, Italy - Lowest Rate Guaranteed! With a stay at Starhotels Metropole, you'll be centrally located in Rome, steps from Teatro dell'Opera di Roma and 3 minutes by foot from Via Nazionale. This 4-star hotel is 0.6 mi (0.9 km) from Via Veneto and 0.2 mi (0.3 km) from Piazza della Repubblica. The hotel put me in the ninth floor, were the room was very noisy to the extent that I did not sleep very well, and the room was with old furniture and small courters. After complaining I was transferred to the fourth floor, it was if I was transferred to anther hotel ! Location to the Rome Termini and to the major sites such as Trevi Fountain and Pantheon. The charge for and the cost of the connection to the Internet. The other hotels we booked on this trip and stayed at before the Starhotels Metropole offered free internet access. Location - Close to the Termini and easy access to all sights via foot or metro. Hotel - Clean and modern of that you expect of a 4 Star. However, the bar staff nor reception staff could NOT supply an appropriate glass for the mini bar drinks when asked. We were expected to use the bathroom water glass for Champagne through to soft drinks. Apparently this is company/Italian policy! Excellent hotel . I did find on the first morning I went for breakfast at 9.45 staff did not want to see us. They were setting up table for next day and it was difficult to make eye contact with them to get tea and coffee etc, even though breakfast was served until 10.15. I thought the staff were very friendly at the reception desk and very helpful, nice to be greeted with a smile. We would have also liked a king size bed instead of two single beds together. Our room was too warm, maybe due to the power failure.